The first version of Google's Chrome OS wasn't much more than a Chrome browser window with a few apps. It felt more like a statement -- "Who needs local storage?" -- than an operating system you could rely on. A year and a half later, the latest version of the Chrome OS adds some of the features of a more traditional OS: a file manager (hooray! ), a desktop and the ability to use storage connected through a USB port. Google's Cloud Print system even makes it fairly easy to print. 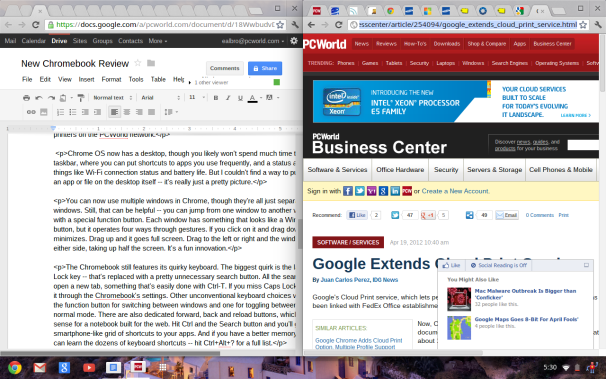 The advantages of the Chrome OS remain the same. The new Samsung Series 5 550 Chromebook I tested shuts down in less than 5 seconds and starts up again in less than 10. When you log in, there's no waiting for programs to load. You go right back to the last browser window you were working in, with all the same tabs you had open before you shut down. Jumping from window to window (that's right -- now you can have more than one) is instantaneous. And while all new machines are fast, it's hard to imagine what would slow down a Chromebook over time -- there's no registry to get junked up and no local software to leave debris on your hard drive. Battery life is great, too. I was able to work a full day on a single charge. And, unlike previous incarnations, you now get a significant price break for buying a Chromebook: The machine I tried, with a 12.1-inch display, costs $449. The Samsung Series 5 13.3-inch Windows model costs about $400 more. 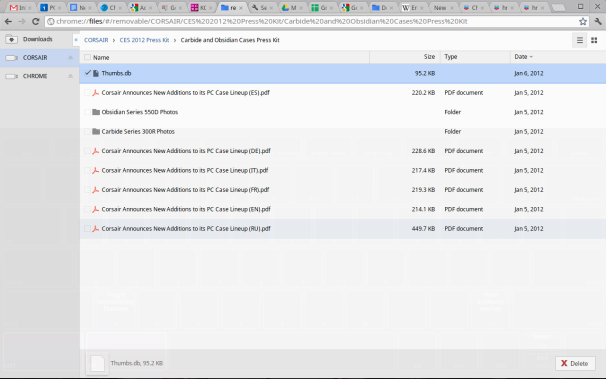 Chrome's new file manager is rudimentary, but its very existence is a big deal. It comes up as a browser tab that shows the different storage devices on your machine. There's Downloads, which sits on the 16GB SSD drive. You can also store files on a USB drive or a memory card. You can move files from one storage device to another, though you don't have the drag-and-drop convenience of most operating systems -- you have to copy and paste them. The very basic file manager in Chrome OS. Printing through Google Cloud Print was simple, even though I didn't have access to an official Cloud printer. I set up cloud printing on my desktop at work (it's a setting within the Chrome browser), then the Chromebook could use any printer my desktop could access, including printers on the PCWorld network. Chrome OS now has a desktop, though you likely won't spend much time there. There's a taskbar, where you can put shortcuts to apps you use frequently, and a status area that reports things like Wi-Fi connection status and battery life. 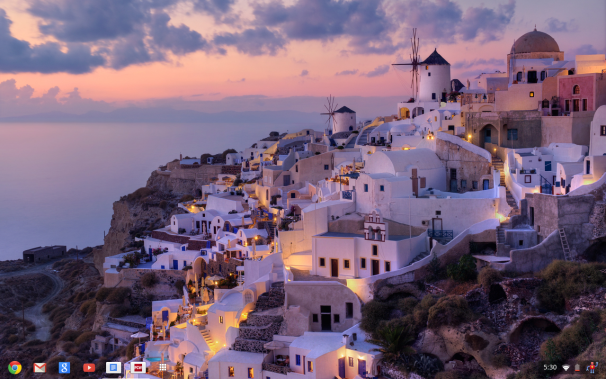 But I couldn't find a way to put a shortcut to an app or file on the desktop itself -- it's really just a pretty picture. 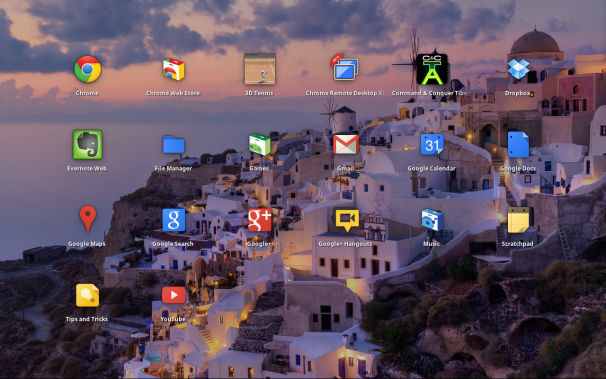 The Chrome OS desktop looks pretty, but doesn't do a lot. You can now use multiple windows in Chrome, though they're all just separate browser windows. Still, that can be helpful -- you can jump from one window to another with Alt-Tab or with a special function button. Each window has something that looks like a Windows maximize button, but it operates four ways through gestures. If you click on it and drag down, the window minimizes. Drag up and it goes full screen. Drag to the left or right and the window docks on either side, taking up half the screen. It's a fun innovation. You can now work with multiple windows in Chrome OS. The Chromebook still features its quirky keyboard. The biggest quirk is the lack of a Caps Lock key -- that's replaced with a pretty unnecessary search button. All the search button does is open a new tab, something that's easily done with Ctrl-T. If you miss Caps Lock, you can restore it through the Chromebook's settings. Other unconventional keyboard choices work better. I like the function button for switching between windows and one for toggling between full screen and normal mode. There are also dedicated forward, back and reload buttons, which make lots of sense for a notebook built for the web. Hit Ctrl and the Search button and you'll go to an smartphone-like grid of shortcuts to your apps. And if you have a better memory than I do, you can learn the dozens of keyboard shortcuts -- hit Ctrl+Alt+? for a full list. Hit a keyboard shortcut and you see links to your apps in a smartphone-like grid. As much as I liked the Chromebook I tested, it had one fatal flaw. I've left it to the end of this review because I hope that it's just a failing of my particular test machine and not one that's endemic to the Samsung Chromebooks. The problem: My Chromebook would regularly lose its connection to the web -- kind of a big deal for a notebook built to work almost entirely online. I noticed the problem both at work and at home. In both cases, I had other systems on the same Wi-Fi network at the same time and they never seemed to lose their connection. I tried using a mobile hotspot and experienced the same problems. In some cases when I had connection problems, the status area would report that it was trying to reconnect to my Wi-Fi network. In other instances, it would report it was firmly on my Wi-Fi network, even though the browser was unable to reach the web. When I tried surfing from my other system on the same network at the same time, I had no problem. A Samsung representative said she hadn't heard about similar problems with other test machines. I'll work with the company to troubleshoot the problem and update this story with what I find out. All in all, the Chrome OS and Chromebooks seem to have made vast strides forward. It'll never be a good solution for people who are often away from a web connection (though it does have a built-in Verizon wireless broadband connection -- you get 100MB per month free and can pay for more) or depend on sophisticated desktop software. Or for those who don't want to have their whole life wrapped up in the Google solar system of Gmail, Google Drive, Google Calendar, etc. But if much of what you do happens in the cloud anyway, a Chromebook has a lot of advantages -- it's cheaper, fast, simple to operate and gets great battery life. Google's other OS has grown up a lot in the past year and a half. Chromebooks are already a good option for many people. If Google can add the ability to do significant work offline, all laptop buyers should give them serious consideration.